The City of Mesa is working with nonprofit agencies and businesses to provide supplies of water to people in need. The 12th annual Mesa Hydration Donation Campaign runs from June 4, 2018 through September 14, 2018. Residents will be asked to donate water at various drop-off locations throughout the City. For a list of drop-off locations, visit www.mesaaz.gov/H2Omesa. The water is distributed through United Food Bank to numerous agencies in the valley, including A New Leaf-East Valley Men’s Center, Paz de Cristo and Mesa United Way. Any Chamber or community member is welcome to bring their donation of water to the Mesa Chamber of Commerce, 165 N Centennil Way, Suite 208, Mesa, AZ 85204. 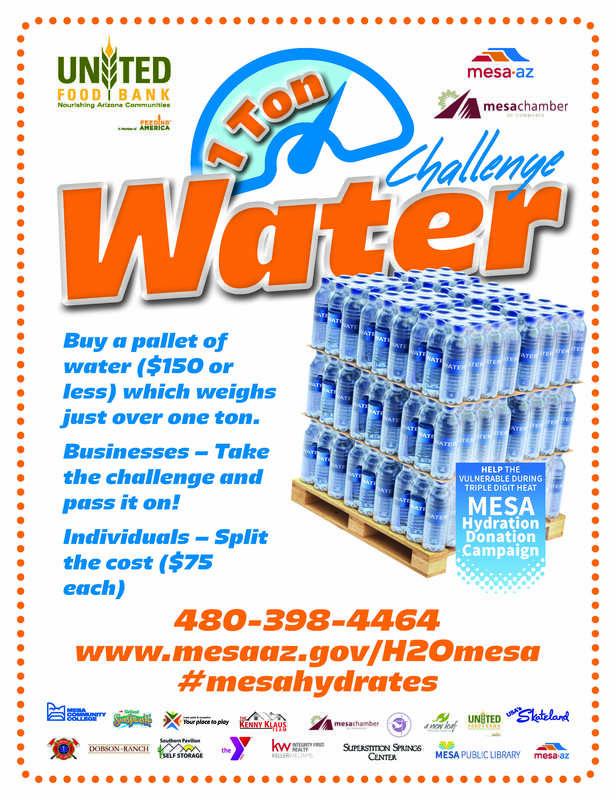 Visit the Mesa Chamber Facebook Page for up to the minute updates on who is Mesa in dropping their H2O.